This Snowball Charm quilt was started in 2002, when I collected 6 inch charm squares. I decided on a snowball block, inspired by a quilt I saw in the book “American Country Scrap Quilts, by Fons and Porter. I finished the centre, but could not decide on the borders. Into the flimsie cupboard it went, waiting patiently until this year, 2011, when my goal was to complete 52 quilt projects throughout the year. I find it amazing how a bit of self-imposed deadline pressure can help me decide quickly on the border. Once decided, finishing is much quicker! With borders on, the backing was easily decided. The top was mounted and quilted within 6 hours. The hand sewn binding was finished the next day. So here is the first finish of November 2011. The stats: 27 done and 25 left to complete by December 31. This top was quilted using the Circle Lord template Swirls, a design that enhances the snowball block. The photo was taken in the late afternoon when the light of the setting sun obscures the blocks, but highlights the quilting. This quilt goes into my wedding quilt stash. Someday, some bride will love this. I know that I do! Scrappy quilts are my favourites! Holy Hexagons, Batman! 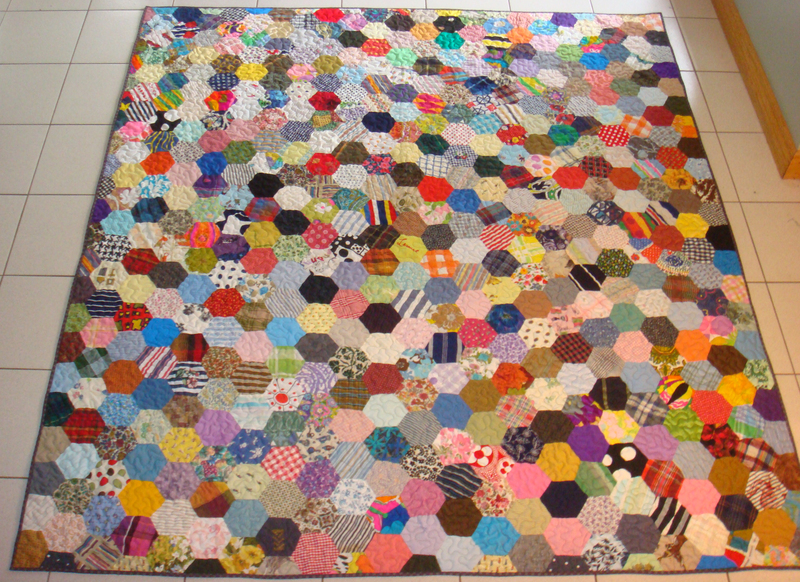 What colour and variety in this hexagon quilt! This vintage hexagon quilt was one of the quilt tops I purchased on eBay. It was not quite as advertized, not by a long shot! The seller had declared a mouse hole, but not the broken seams, pin holes and the very wide variety of fabrics types that were definitely not quilting cotton – flannels, suitings, acetates, rayons, woollens, voiles – you name it and it is in this quilt. It was sewn by hand, but the exceedingly bulky seams had never seen a pressing iron and it did not lay flat. In the bottom left hand quadrant, there was so much extra fullness, I could have hidden my latest fabric shopping purchases under it! However, despite all its flaws, I still found it to be charming and decided to repair and replace. After living in my flimsie cupboard for several years, I decided to tackle it this year. 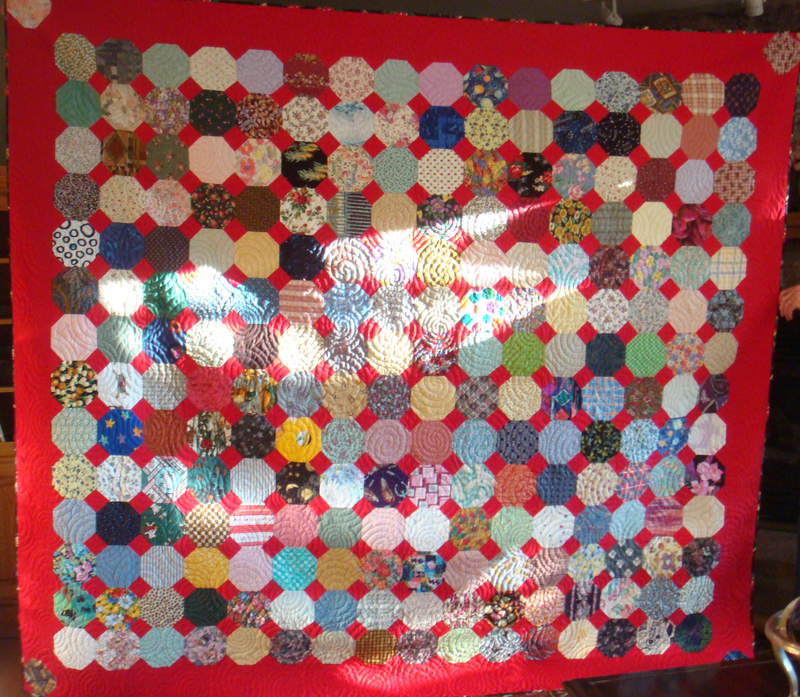 I spend New Years Day 2011 working on this quilt. (Everyone else was recuperating from our party the night before, so I had lots of free time!) The big holes were easy to spot and replace. As I got into it, I found many more pin holes. I persuaded my very patient husband to help me hold it up to a picture window to allow me to locate the holes. After carefully checking every hexagon, I marked those hexagons with holes and then set about replacing those blocks. I estimate I replaced about 20 hexagons. The area with the extra fullness was a bigger challenge. I ended up taking a small seam inside each of every hexagon in that area to shrink the fullness. It was a lot of work, but it seemed to do the trick, eventually becoming relatively flat. As I worked on this quilt, I wondered if it might have been a lot faster to start from scratch and make an entirely new quilt. Maybe, but I love old textiles. The variety of patterns in this quilt speaks to my heart. The only option for quilting was a fairly dense meander to quilt it into submission. I loaded it on the longarm and quilted strategically , aiming to hit most seam intersections with a goal to strengthening the quilt. It turned out much better than I expected. The binding is a narrow violet print, hand stitched to the back. This is one quilt that definitely is not worth the amount of time it took to hand stitch the binding, but it really does look nice. I wondered as I was stitching down the binding if my unconscious goal was to rescue the quilt and give it a better finish to its life than it had until it came to my door. Finished size is 72″ by 80″, a generous throw size. The quilt will be used as a teaching sample for my “Sensational Scrap Quilts” classes until someone chooses it as a gift. This is one more top done and out of my flimsie cupboard and counts toward my goal of 52 completed projects in 2011. The tally as of today: 24 done-done and 28 more to go. There are 9 more weeks in 2011, so that makes an average of three per week I need to complete to meet my goal. Ambitious, yes. Crazy,probably. But I still think I will manage it. I have many works in progress that just need some finishing to get them to done-done stage. Keeping myself focused on the goal will have very satisfying results! I predict that I will be able to start 2012 with a clean slate without the distraction of unfinished projects pulling my attention away from the creative new projects I really want to start! The results should be a huge win all the way around!